This episode of The Engineering Commons finds Adam, Brian and Jeff talking about steel, the most common of engineering metals. Steel is not an element one can find in the periodic chart; it is rather an iron alloy. One of the earliest sources of iron was iron meteorites. A key component in steel is carbon, which is alloyed with iron in percentages (by weight) from about 0.5 to around 4 percent. Iron ore is rock that can be mined from the ground and processed to obtain fairly pure iron. Once treated as a waste product, Taconite is now mined for its iron content, which is about 20 to 30 percent by weight. The largest deposit of iron ore in the United States is the Mesabi Iron Range, located in the state of Minnesota. Hematite is a type of iron ore that is reddish in color, and has a high iron content (between 55 and 70%). According to at least one website, the “ite” suffix used in many geological and metallurgical names comes from the Greek word “lithos,” meaning rock or stone. Brian notes that, due to its once high economic value, an aluminum cap sits atop the Washington Monument in Washington, DC. Named for Henry Bessemer, the Bessemer process made large-scale steel production economically feasible. Coke is the primary fuel used in heating iron ore to a temperature where the iron melts and flows out of the blast furnace. There are fourteen different metallic lattice structures found in nature, but the two most common are the Body-Centered Cubic (BCC) and the Face-Centered Cubic (FCC) arrangements. Allotropy describes the capacity of certain elements to exist in two or more different phases while in a common physical state. An alloy is the mixture of two or more metals, or the mixture of a metal with one or more additional elements. At room temperature, iron exists in a BCC crystalline structure known as ferrite, or alpha iron. When heated to a temperature between 912 and 1,394 °C, iron assumes a FCC crystal structure known as austenite. Wrought iron is iron with a very low carbon content; this makes it easy to bend, form, and weld. Low carbon steel is iron that has been alloyed with between 0.05 and 0.25% carbon (by weight). This is also known as “mild steel,” and is easily machined, formed, and welded. Medium-carbon steel has a carbon content of between 0.3 and 0.6% by weight. The increased carbon content gives these steels greater hardness and wear resistance. High-carbon steels have a carbon percentage of between 0.65 to 1%, giving such steels a very high surface hardness that makes them useful for cutting tools. Cast iron has a carbon percentage of around 4%; this type of iron alloy is easily cast, but is rather brittle. Rapid cooling of a heated material is known as quenching. The process of quenching a low-carbon steel heated to the austenite phase produces a very hard and skewed BCC crystal structure known as martensite. Pearlite is a microstructure composed of alternating layers of ferrite and cementite. The final phase structure for steel can be determined from Time-Temperature Transformation and Continuous Cooling Transformation diagrams. Annealing is a heat treatment that reduces the number of crystalline dislocations, and thus increases a metal’s workability. In contrast to annealing, tempering is a heat treatment used a remove some, but not all, of the hardness that has been intentionally introduced into a metal. Adam notes that quenched steel can be very brittle. Welding can introduce unwanted hardening or softening of joined materials. 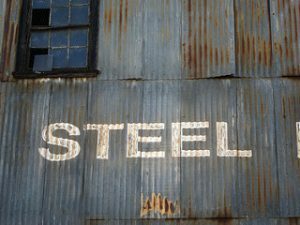 Steel can be brought to shape using either hot-forming or cold-forming processes. Steel specifications are available from numerous engineering bodies, including the ASTM and SAE. One well-known corrosion-resistant family of steels is Hastelloy, produced by Haynes International. Thanks to Dennis Hill for use of the photo titled “fpx090412-06.” Opening music by John Trimble, and concluding theme by Paul Stevenson. The highlight of my engineering career: correcting the Engineering Commons podcast! You have the paperclip example backwards. It is the presence of dislocations in the crystal structure that enables steel and other metals to be more malleable than a more ordered structure. Cold working occurs when many of these dislocations resolve themselves by tying into the ordered structure. Wikipedia confirms my memories of my ( 20-year old) memories undergrad Material Science courses– ordered crystals have more atomic bonds while dislocations have few bonds, making them easier to break. There is a relationship between dislocations and grain structure, but not all dislocations are at grain boundaries. And now, you’re pushing my memory. I studied MSE in undergrad, but I’ve rapidly devolved into a manufacturing engineer.